Construction has begun on a £9 million cold storage facility and transport depot, the first of its kind in Northern Ireland, at Carn Industrial Estate. Carn Coldstore is owned by Patrick Derry, Managing Director of Derry Refrigerated Transport. With support from First Trust Bank, the 52,000 sq ft warehouse facility, due to open in Autumn next year, will be the tallest in Ireland standing at 17.5 metres high and will allow products to be stored from -25 to +5 degrees. A new venture for the Kilmore businessman, Carn Coldstore is expected to create 50 new jobs by 2020. The cold storage and freezer facility will be equipped with state-of-the-art Co2 refrigeration equipment provided by Armagh company, Cross Refrigeration. The site will also feature rain water harvesting technology, helping create further energy efficiencies and reduce the business’s carbon footprint. 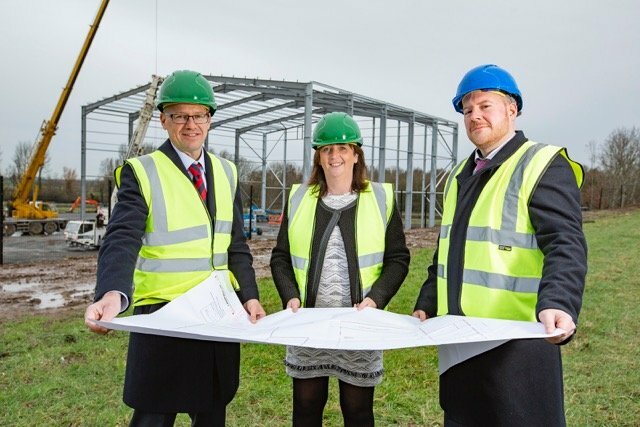 Photo caption: Richard Gillan, Managing Partner, Grant Thornton, Michelle Harbinson, Head of Business Acquisitions, First Trust Bank and Carn Coldstore owner Patrick Derry are pictured at the site of the ground-breaking £9 million cold storage facility at Carn Industrial Estate, Co Armagh.